Riding on unfathomable volumes of industrial expertise, we are actively committed towards providing world class D Shackles. Specification RR-C-271, EN 13889, British Standard 3032, DIN 82101, DIN 82016 etc. 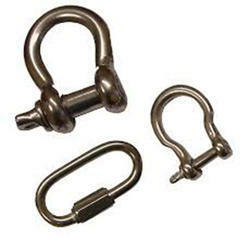 We are the leading manufacturer and supplier of d shackle as per customer specifications. Owing to the rich industrial experience and expertise in this business, we are engaged in providing Weld On Hook. 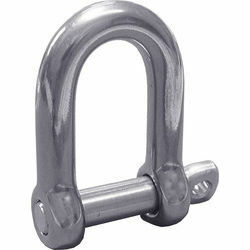 D Shackle offered by us is manufactured using best available techniques and under the firm direction of experienced quality controllers. Bow & Dee Shackles of nut bolt type pin, round pin or with screw, eye & collar of various sizes are available. Material used is either Mild Steel or Alloy steel with varying hardness. The shackles can be either galvanized on un galvanised, based on user requirements. All shackles comply with ISS standards for size specification of body, pin and jaw opening. We are into offering a quality upgraded scope of Forged Shackle to our customers.